We have yet to visit a manufacturing facility (including ours) that does not have a problem with equipment overheating. Compressor and vacuum pumps are definitely the worst for overheating as they run constantly and under full load conditions. 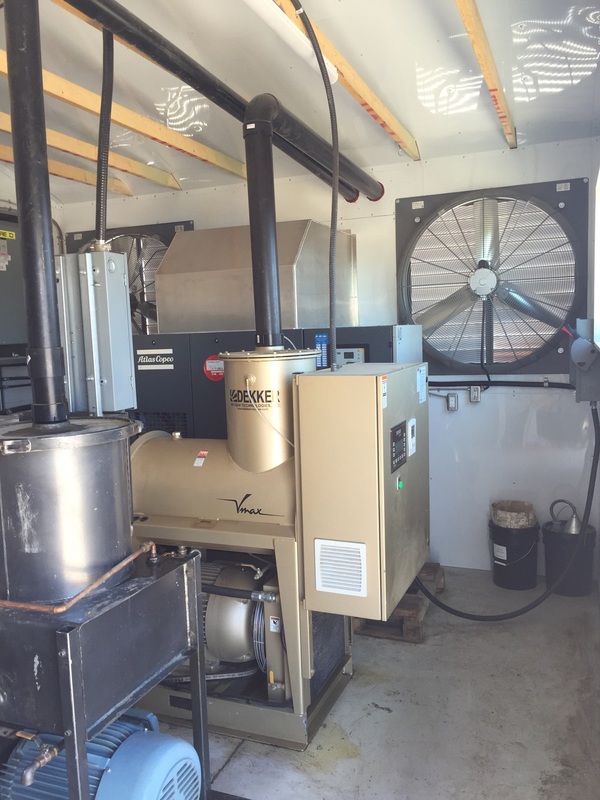 It is ideal to keep a noisy compressor outside of the main plant, but protecting the compressor from the elements means possible overheating as it is difficult to build a big enough shed to handle the heat load. Rather than go buy a large sea can or simply build a larger housing, we decided to design and build our very own wind tunnel. If you are driving by our plant you may notice the new compressor structure off the back of the building. The base is made of steel so the entire structure can be moved easily for future expansion. The bottom side of the steel base has 8" of spray foam insulation. The north side of the structure is the intake and has louvers to keep driving rain or snow out. The north side intake means prevailing winds help to increase airflow. Directly behind the intake are slide-out removable filters so all air entering the structure will be free of debris. Moving inside the structure, the entire intake wall is made of 6 electrically controlled dampers. These dampers open based on the inside temperature so only the necessary amount of air passes through. This is great for the winter months when almost no outside cooling air is needed. Here is a view of the south wall with 2 of the fans. You can also see the compressor and 2 vacuum pumps installed. We sized the fans to completely exchange the air in the building in 30 seconds. Notice the walls are also lined with white aluminum sheeting so cleaning the entire structure is simple. Behind those walls is 6" of spray foam insulation to stop moisture build up and to make sure that the structure can hold its own temperature no matter what the outside ambient is. All of the fans and dampers are thermostatically controlled through a custom programmed PLC. At certain set points, dampers are opened and fans turned on so the minimal electricity is used and ideal operating temperatures are maintained. 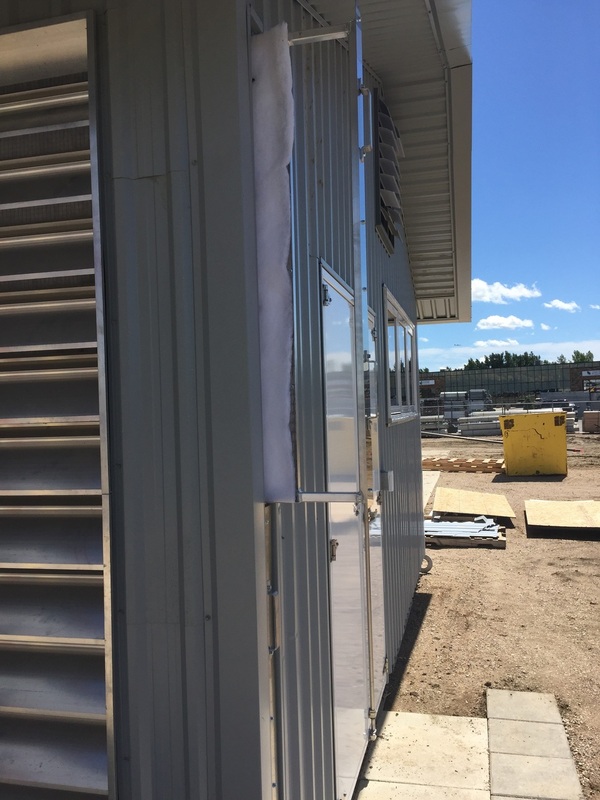 A gable mounted cross draft fan was installed to add additional cooling as well as draw in warm shop air in the cold winter months to prevent freeze up. Electricity service to the shed is 600V, and the appropriate transformers are installed to drop down to both 460V and 208V. Notice the use of LED overhead lights to make sure maintainence and electricity use are at a minimum. Outside the south wall, you can see the flaps open for both one large exhaust fan and the gable fan. As a side note, the white entry doors (left side of picture) were also manufactured in house at Lean Machine! Steel Pipe on the bandsaw, Laser cutting, machining, welding, and some black powder-coating from our friends at Advantage Powder. Sometimes it's hard to believe how many different areas of our production a part can cross. This wasn't robotically welded but thanks to our Fronius Transteel welders you can't tell the difference. That's a clean looking steel bead layed on this part! What starts as a really cool aluminum sphere made on one of our CNC lathes is actually the bottom of street lamp brackets all over downtown Saskatoon. Here is a Google street view of an example of this part. If you can see the bracket attached to the pole, the sphere is opposite the light fixture. Some trick tap handles one of our engineers designed up for a local brewery. We don't normally do smaller jobs like this at Lean Machine but sometimes you have to break the rules. I think the results show that if you have access to the most advanced equipment in the world the possibilities are endless. Normally cutting 10g thick steel with this much detail would result in a glob of molten metal left on the table but our HK laser and a great programming sequence made it happen. The rear handle is Stainless Steel and the front handle is Mild steel. Lean Machine is officially 10 years old! We have enjoyed every day of the past 10 years (six for Zach and Shaun) and we look forward to the future as there is exciting things to come. We stand by our motto of: A Better Part for a Better Price. There is more automation, leaner processes, added capabilities, and much more to watch for from the team at Lean Machine. Here is Zach and Shaun doing what they love best....Making chips! An aggregate tool is a combination of a gear box and a right angle adapter. Aggregate tools allow us to drill or cut from the side of a part instead of just from the top on a typical 3 axis machine. Here is an an example of an aggregate tool. The top of the tool attaches to the spindle and turns at a speed of 10,000 rpm. Different drills or cutting tools can be attached to the collets at either end. This is a saw blade attached to the aggregate head mounted to the spindle of the machine. The machine is about to cut a part for a customer made from aluminum extrusion. 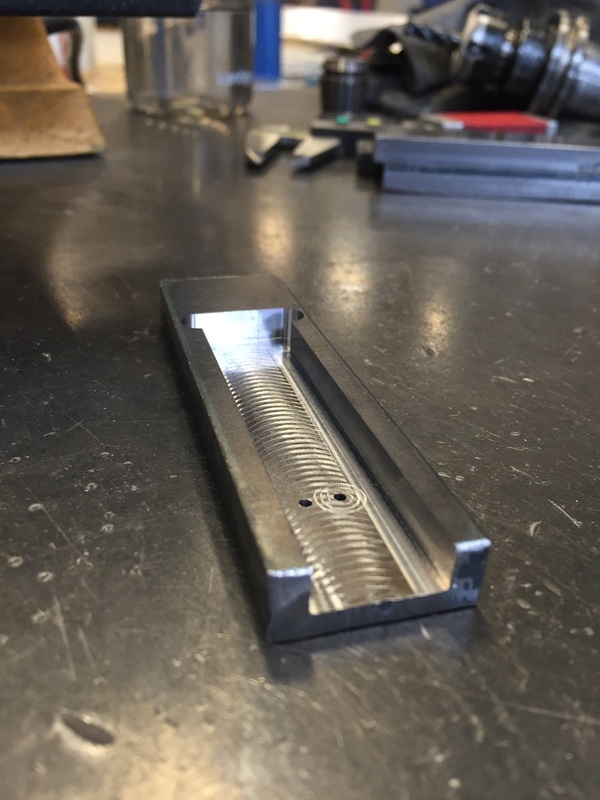 The extrusion is mounted in a custom fixture on our C-axis router. Here is the finished angle cut on the end of the extrusion. Conventional tools would have to be very long to make a cut like this from the top plane and would not have the great finish and accuracy that the aggregate saw tool has.